Emergency Room visits: What causes them? Well, it's not lightning strikes, shark or snake bites, zombies, time-travelling humanoids, or national emergencies. The common threads in Thom Disch's book, Stop the Slip: Reducing Slips, Trips, and Falls makes clear, are typical incidents that frequently occur in your own home and workplace and can lead to serious or even life-threatening injury. No age group is immune – from toddlers tumbling down stairs to senior citizens slipping on a bathroom tile floor. Disch's book clearly reinforces the damage caused by slips, trips, and falls. In it, the author includes narrative stories about people who have suffered injuries due to falls, with statistics that define how extraordinarily wide-spread injuries and their economic impact are. If you have been contemplating installing safety rails in the shower, or had a few close calls on your stairs, reading this book will encourage you to get to work on the project without delay. Disch also markets a line of safety products, and we installed and tested two of his items. People Treads are clear self-adhesive strips to go on the treads of your hardwood stairs and provide a softly textured non-slip surface. Handi Treads are more heavy duty, perfect for outdoor use. These are clear strips with a matte finish, that visually blend with the surface of indoor hardwood stairs. Installing them is easy. First, make sure the stair treads are clean and free of dirt, oils, and residue. Second, realize that the strips are essentially permanent, and if you try to remove them, there is a significant chance that your floor's finish will be damaged, so make sure you're positioning them in precisely the spot you want them. 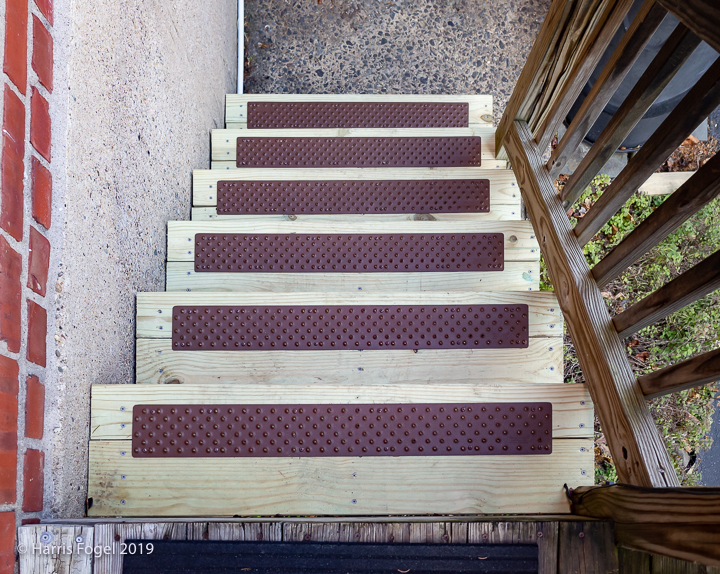 People Treads are not completely transparent, so while not invisible when installed on stairs, but they made stairs noticeably less slippery then our normal hardwood floor finish. The stairs feel noticeably safer and easier to navigate, especially when we were wearing soft slippers (we try to never go up or down the stairs in stocking feet – too dangerous!). We used two packs to complete installation on our 12 steps. Our outdoor deck is made of older, pressure-treated wood, and the steps have a 1.5-inch overhang. After years of hot summers, direct sun, freezing temperatures, snow, ice, and polar vortexes, the wood had started to chip, splinter, and break. It was time to replace with fresh pressure-treated wood, but even then, Disch's book convinced us that those exposed treads were still dangerous. The solution was a set of Handi Treads. Installing the aluminum treads was easy. They are available in plain silver, black, brown, and safety yellow. We chose brown, which blended into the environment, and are the most popular color for homeowners. They ship with a set of painted stainless steel screws. The treads include screw holes to make installation a snap. Using a portable battery-powered screwdriver, and a small drill to pre-drill holes, mounting was easy. During installation, we discovered some weather-related damage to the hanger (the step assembly the treads mount to) so it took a little extra time to cut and mount braces to the damaged areas. The treads are an OSHA Approved Safety Surface for Steps – 1910.24(f), and can be used on concrete as well as wood. How did they work? In a word, perfectly. They provide a firm non-skid surface even during pouring rain, yet not so sharp you can't walk on them barefoot. In snow and icy conditions, they provide a very safe surface, and their design allows the water to drain rather than pooling up, which can often rot the wood surface. Plus, they're made in the USA. An alternate approach is a Stair Nosing design, that wraps around the leading edge of the stair. They are considerably more expensive, at $28.95 each, vs. $19.99 for the Handi Treads, but provide protection for the vulnerable nose of the tread. Either solution works well. One of the key lessons of Stop the Slip: Reducing Slips, Trips, and Falls is that we all need to pay closer attention and concentrate whenever taking a step. Rock climbers and dancers are taught to have a high level of attention to foot placement, but most injuries occur in the home or walking down the street. And as you might imagine, texting doesn't help matters – anything that distracts from focusing on where you are putting your foot down can lead to a fall. Stop The Slip - Reducing Slips, Trips, and Fallsis a great primer on how to prevent injuries in the home and workplace environment. The book includes information regarding liability concerns, and has enough statistics to make you reconsider every step. Handi Treads and People Treads come Highly Recommended to stave off life-altering trips to the Emergency Room!